When she arrives on the remote island of Thaxos, Kate thinks she's going to enjoy a relaxing holiday. Instead, she quickly learns that Thaxos is ruled by a mysterious family known as the Le Comptes. The head of that family, Edgar Le Compte, has just returned after spending many years away.Locals believe that the Le Compte family are all vampires, and that their return will plunge Thaxos into a fresh period of turmoil. As Kate learns more about Edgar Le Compte, she begins to realize that his hold over the island stretches back much further into history than she'd ever imagined. Even when he tries to win the locals over, however, Edgar ends up alienating the local population. Soon, a plot is forming. If Edgar won't leave Thaxos alone, there are people who are willing to force him away, even if that means ending his life. Dark forces are closing in, but Edgar refuses to budge. As far as he's concerned, Thaxos is his birthright and he'll never leave. The stage is soon set for a showdown that could have tragic consequences. The more she learns about Edgar's past, the more Kate starts to wonder what he's really hiding. Why did he leave Thaxos for so many years, and what really happened to his old friend John Nixon? Meanwhile, Cavaleri's plans gather pace, and soon a deadly raid is launched. By the end of the night, some lives will have been changed forever. And some will be forever lost. Dead Souls - originally released as a serial - is an ongoing horror series. Each book ends on a cliffhanger, and readers are highly advised to read the series in order. A face from the past causes trouble for Edgar, who finally has to face the truth about his past actions. 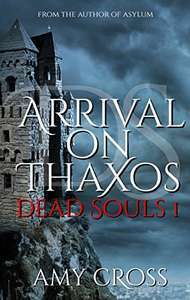 Before he has a chance to make amends, however, he finds that the whole of Thaxos seems to be turning against him. Meanwhile, Kate begins to think that nothing is what it seems. After her horrifying night at the castle, she can no longer pretend that she hasn't been changed by her time on the island. But what is the truth about the strange creature that has finally been released, and can anything now stand in the way as destiny marches toward yet another tragedy. When the citizens of Thaxos rise up against Edgar, a new dawn is promised. Soon, however, that new dawn is stained with blood. Without Edgar to hold her back, the Witch of Thaxos is free to make her return. And while she can offer help to those who are most in need, the witch requires something in return. Meanwhile, Kate starts piecing together some clues about the island's past. Secrets are buried on Thaxos, and some of those secrets are straining to come back to the surface. And the Witch of Thaxos isn't the only returnee, as a boat arrives with a dangerous passenger. Stranded in the past, Kate finds herself facing a very different Thaxos. Edgar and Madeleine rule the island from their mansion, surrounded by a group of friends. For Edgar, Kate's sudden appearance is a shock as he prepares for his wedding to Estella. And for Estella, Kate is a very unwelcome guest. As she explores the island's past, Kate begins to learn a little more about the Le Compte family. Soon, however, she discovers that something deadly is on the loose. A Tenderling has escaped, and anyone who ventures into the wilderness is in danger. Thanks . Wow, the first 7 books for free, that's unusual. Normally it's just the first one, to lure you to buy the rest of the set. Good find. books 8 - 12 only 99p each. Not read books but heat for the find.